It’s inevitable that you’ll catch a cold or flu from time to time, even if you eat well and wash your hands regularly. While colds don’t usually last more than a week, being sick is a universally miserable experience. The flu comes in a variety of strains and may stick around longer than a cold, meaning you’ll be bundled up for bed rest and fluids for quite a while. Antibiotics aren’t an effective treatment for either of these illnesses, but over-the-counter medication can make a difference in your symptoms. However, there are also plenty of natural cold remedies for you to try. Although they’ve been proven to work through various studies, you should always talk to your doctor before starting a supplement to be sure it won’t interact with any pre-existing ailments or prescriptions. As you work your way though cold and flu season, read about these five plants that can relieve some of the symptoms. Vitamin C, one of the first vitamins that people go to when they feel sickness coming on, can be found in citrus fruits as well as supplemental pills. Research from the U.S. National Library of Medicine’s National Center for Biotechnological Information showed that high doses of vitamin C at the onset of a cold can decrease its duration. The ways you can use peppermint to soothe the symptoms associated with winter illnesses are at least three fold. The plant’s main active ingredient is menthol, which thins mucus and loosens phlegm to make your cough more productive. Putting mint extract or an over-the-counter product that includes menthol under your nose and on your chest can give you these benefits. If you’re experiencing a sore throat or an upset stomach, a steaming mug of peppermint tea could make all the difference. Garlic has long been touted for its ability to boost your immune system. You can reap the most benefits from eating garlic if you start at the beginning of cold and flu season, but it can shorten the life cycle of your cold regardless. The University of Maryland Medical Center cited a study that found people who took garlic supplements between November and February experienced fewer colds. Additionally, the illnesses didn’t last as long for people who were regularly taking garlic. 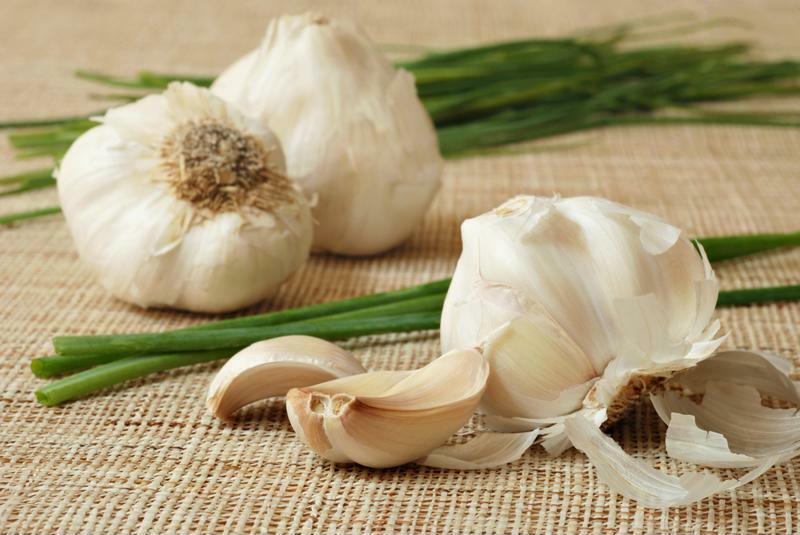 While your breath won’t be pleasant, you can mince or chop a clove of garlic to eat each day. Fresh garlic is best for bolstering your immune system. This plant has been used for several medical purposes over the years, but it’s been proven to decrease the duration of cold and flu symptoms. People often ingest elderberry in the form of Sambucol, an over-the-counter syrup. According to UMM, a study showed that taking Sambucol can shorten the length of the flu by three days. Elderberry also comes in tablets and tea, but it’s important that you don’t eat uncooked or unripe berries if you’re making your own supplements, as they can be poisonous. Be sure to consult your doctor before starting an elderberry regimen, particularly if you have rheumatoid arthritis. Ginger root and extract can benefit your body in a litany of ways, from quelling nausea to relieving congestion. It’s been used in Chinese medicine for centuries, whether in the form of hot tea or ground up in meals. The UMM noted that people who have diabetes, heart conditions or take blood thinners shouldn’t add ginger to their diets without talking to their doctor first. These herbs will not only create a beautiful garden but also will be useful to you and your family when colds, coughs, and flu strike. Consult the Compendium of Tea Herbs for specific herb and brewing information. This pretty garden looks complicated, but it’s really quite simple to plant and maintain. The long rows of herbs will fill out beautifully in two or three years to create a deep border; this will provide enough density to keep weeds at a minimum. To incorporate a diversity of heights, plant linden, elder, and other tall plants in the back, then taper artistically to the low plants in front. Number indicates quantity of plants needed.